Ellen Frances McGovern was born on 9 September 1864 at Cambridge, Middlesex County, Massachusetts. She was the daughter of Francis McGovern and Mary Rowe. 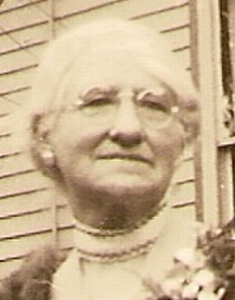 Ellen Frances McGovern died in September 1941. She was buried on 26 September 1941 at Holy Cross Cemetery, 175 Broadway, Malden, Middlesex County, Massachusetts. [S247] 1865 Massachusetts state census, Middlesex County, Massachusetts, population schedule, City of Cambridge, ward 3, page ?, dwelling 422, family 737, Francis Mc Govran. [S238] 1870 U.S. census, Middlesex County, Massachusetts, population schedule, City of Cambridge, ward 3, page 100, ? (stamped), dwelling 570, family 792, Francis Mc Govern. [S252] 1880 U.S. census, Middlesex County, Massachusetts, population schedule, City of Cambridge, ward 3, ED 438, page 20, ? (stamped), dwelling 139, family 213, Mary McGovern. [S16] Michael E. Jennings and Ellen F. McGovern marriage. [S25] Somerville City Directory 1889;. [S287] 1920 U.S. census, Middlesex County, Massachusetts, population schedule, City of Waltham, ward 2, ED 486, sheet 6B, ? (stamped), dwelling 103, family 130, Michael E. Jennings. [S288] 1930 U.S. census, Erie County, Pennsylvania, population schedule, City of Somerville, ward 5, ED 449, sheet 4A, 144 (stamped), dwelling 40, family 88, Edmond L. Jennings.